Seeing your doctor can be time consuming. You have to make an appointment, go into the office, fill out paperwork, sit in the waiting room, then sit in an examination room, and then talk to a nurse before you're likely to see a doctor. Some medical conditions may not necessitate that much trouble. In cases where an out-and-out doctor's visit is not required, your smartphone can come to your rescue — answering questions and offering qualified advice. Before you download any of the medical apps we're about to recommend, check with your insurance company to see if they have an app of their own. Some have their own nurse hotlines you can call with medical questions — for free. If they do, you may get more service for less money. But if they don't or if you don't want to get your insurer involved, turn to these apps for medical answers. Need immediate medical advice but not sure you need a doctor? 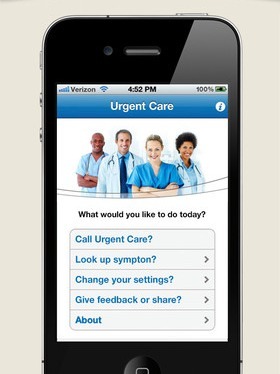 The Urgent Care app is just what you're looking for. This app has a medical dictionary and a symptom checker for self-diagnosis, but its most notable feature is the ability to get in touch with one of Urgent Care's registered nurses at any time. If you have a problem that needs a doctor, the nurse can get a doctor on the line who can even prescribe medications. 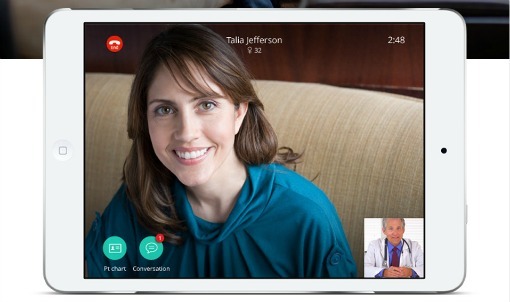 It's like visiting the doctor — without having to actually visit the doctor. You can also request a medical professional that speaks English or Spanish. Price: Free on iTunes and Google Play. Contacting a nurse costs $3.99 — a small price to pay for the convenience. If you have non-urgent medical questions that don't seem worth going to the doctor or calling a nurse to get answers for, HealthTap may be the solution. On HealthTap, you can ask questions that will be answered by U.S.-licensed physicians within a day for free. Or, you can browse through the many questions that have already been answered on the service. 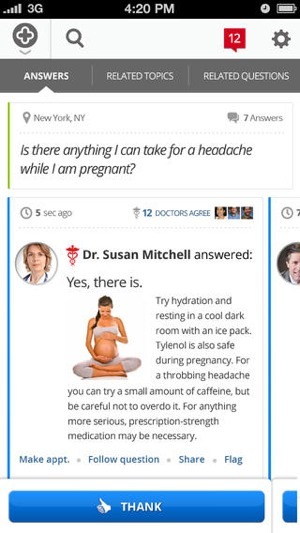 In addition to questions and answers, the app has health tips and app recommendations from the medical community. With more than 60,000 doctors participating, it's packed with content. If you don't need built-in access to a live medical professional, our pick for the best first aid reference app is the American Red Cross First Aid app. It provides detailed instructions for dealing with countless medical situations from bug bites to CPR. Whether your medical emergency is minor or major, First Aid walks you through what you need to do with clear, step-by-step instructions and videos. And if you have a real emergency on your hands, the app will help you get in touch with the appropriate emergency services. All the information and instructions in the app can also be viewed in Spanish. Our advice? Don't wait for a medical emergency. Download one of these apps today so you'll have easy access to important medical information when you need it. Whatever your medical problem, one of these apps should be able to offer help. Have favorite apps of your own? Let us know in the comments! Where are you getting the pricing for HealthTap? Is that the pricing that was updated today? Their website which features the graphic used at the top of this article shows very different pricing for HealthTap + or Prime @ $99 per month for the first family member. You actually have to start the “Buy Now” process to find that out since they don’t seem to publish pricing anywhere anymore. I have to say the UI of the site is frustrating, at best. Not having an easily accessible Pricing page that clearly outlines what you’re buying is disrespectful of prospective customers. I came to comment about the same. It’s just so standard to have a pricing page at the bottom (at least!!!) that I found the whole thing VERY unprofessional. The price we posted was the one we got when we went through the whole process of setting up a live consultation. I’ve contacted the company about the price discrepancy.